A few months ago I was the lucky winner of the CD Sunday Challenge. In the prize package was a CD called Floral Designs for Card Making. I created this step card using a stepper cut file from the Silhouette store and a image from the Viola collection in the Floral Designs CD. I added the Happy Birthday saying to the flower image, then printed out the Viola sheet. Created the polka dot paper in GIMP. Cut out all the pieces with my Cameo. WOW! Another BEAUTIFUL creation Deloris! Love the dimension you've added to the flowers!! Great job! Thanks so much for joining in the fun at our Double D ‘Polka Dots’ challenge! We hope you’ll come back often. Gorgeous creation and lovely design, I love your floral image, so glad your prize has been useful to make some more gorgeous cards. Ohhh, you created another beauty Deloris. Definitely a keepsake. Oh how pretty. Thank you for sharing with us. I love those flowers. 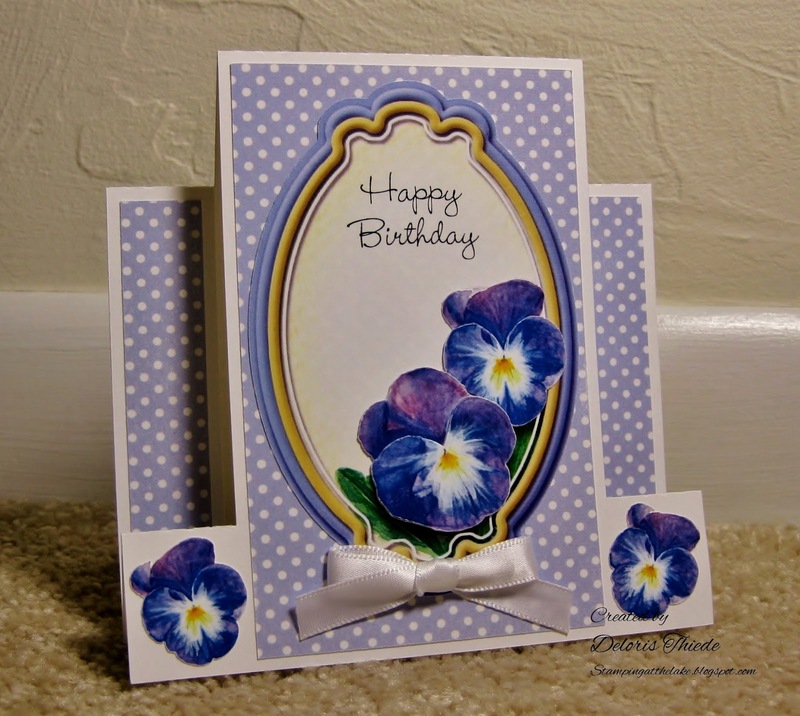 Another beautiful card Deloris, a fabulous design and such pretty violas. This is lovely! Thanks for joining us at C.R.A.F.T. this week! What a really pretty card - I love the violas. Thanks for joining in the challenge this time. What a beautiful card Deloris. Those Violas look as thought they are velvet. I am so glad that the CD that you won in our Birthday Challenge has been useful to you. another beautiful card with the image. Isn't it amazing just changing the layout brings even more interest to the same image? Hi Deloris, I just popped back to say thank you for joining us for our Anything Goes challenge at Polkadoodles.